The past continuous tense is one of the most graphical tenses in English. By “graphical” I mean that it is easy to demonstrate the difference between the past simple and past continuous tense in a video or in a short dramatic sketch. Unfortunately, I could not find a video demonstrating the difference betweent the two past tenses, and that is why I created one myself. In addition to this video I created an infographic and an online quiz to practise the past continuous tense. 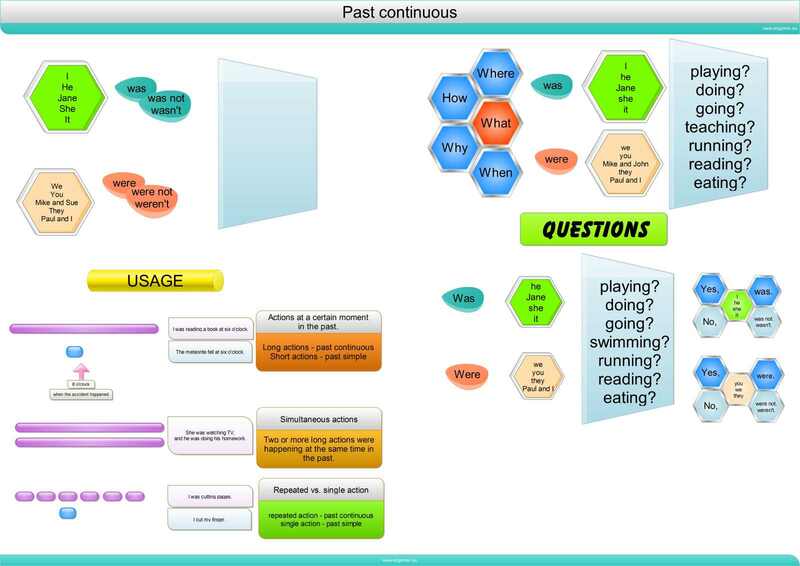 This infographic explains the form and the usage of the past continuous tense in a graphical way. First, concentrate on the form. Explain that the students have to use the verbs WAS or WERE and the verb ending with -ing. Then explain how the negative and questions are formed. If your students cannot create the -ing form properly, refer to the following post on the present continuous tense, which shows how the -ing verbs are formed. Once you get to the usage of the past continuous tense, play the video. Play it twice and the second time stop the video and highlight the differences in the scenes and the tenses. You can use the following online test in class or you can ask your students to do it at home. The online quiz consists of two parts. In the first part, the students are asked to put the verb into the past continuous tense. In the second part they have to choose either the past simple tense or the past continuous tense. If you want to play the online quiz in full screen click the button below. You can find one more post on past continuous tense here. There is also a good discussion of the past continuous tense at the British Council site. And the last link is to the BBC Learning English site.